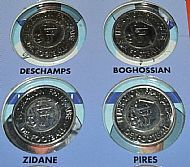 Dating to 1997/98 but with no mention of the world cup this 16 coin set was produced by the same people who did all the Sainsbury's ones at the same time, The Continuity Company. They also sold this idea to many other clubs and countries. Usual footie themed cover to the collector album. The France 98 French squad plus manager. 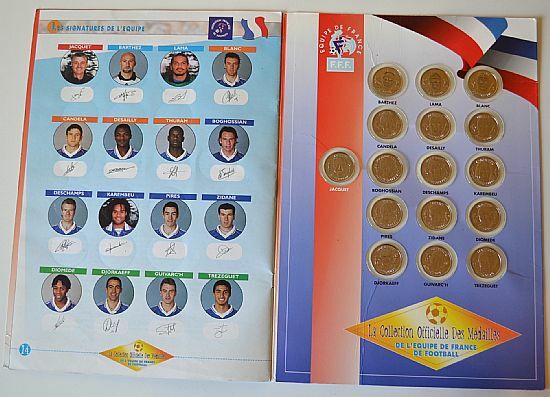 Each coin is sealed in a bubble in the folder so you only bought this as a complete set and not collect coin by coin. The coins are mounted in clear double sided bubbles so you can see the reverse too.